Sharpening your chainsaw can cost up to $4 at a hardware store. This can be costly in the long run, seeing that some electric sharpeners cost between $30 and $40. Not only that, but most sharpeners are designed for heavy duty, letting you sharpen more than just a few chains every day. There really isn’t a reason not to own a convenient chainsaw sharpener for use at home. 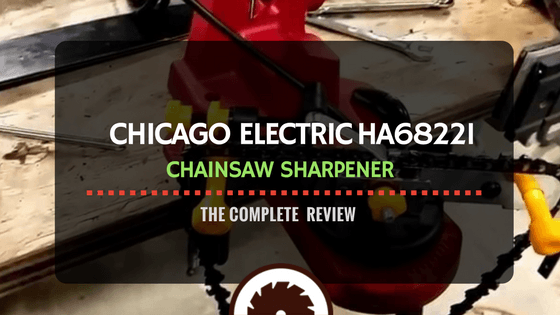 In our Chicago Electric Chainsaw Sharpener Review, we’ll see why this sharpener from Harbor Freight stands out as one of the best in most electric chainsaw sharpener reviews. The highlight of the Chicago chainsaw sharpener is in its performance. It is an ideal unit when you need to sharpen your chain fast and precisely. Fitted with a 4200 RPM motor, the sharpener shows great power during sharpening. When you set your chain right, the sharpener will give you even sharpening. This is enhanced by the fact that you can adjust the sharpening angle to meet the chain design and pitch. A beginner can sharpen in 10 minutes while an experienced user can sharpen in less than 6 minutes. The Chicago electric chainsaw sharpener mounts on your wall, vise or bench. Again, assembling the various parts of the sharpener is easy thanks to the manual and the simplicity of the parts. This makes the sharpener a favorite among people who don’t have much experience sharpening chainsaws. Starting the sharpener is easy. All you do is plug it into a 120v power outlet and push the power switch. Even while the unit limits portability, it functions awesomely without unnecessarily using a lot of power. If you are cutting wood away from home, you can sharpen in the morning and leave the sharpener at home. Given the high speed of the unit, the manufacturer cautions users against working with no protection clothing on. When making adjustments on the sharpener, you are advised to switch it off first. For starters, the Chicago electric chain sharpener comes with a chain vise, which allows you to adjust the cutting angle to sharpen different chains precisely. You need to check the owner’s manual for the exact sharpening angle. Its chain rotation rollers move the links, thus letting the chain stay in position during sharpening. This further enhances the preciseness of sharpening while reducing setup time. The chain stop holds the chain in position during sharpening, reducing unnecessary movement that might lead to uneven sharpening. Better still, the sharpener features a sliding guide that lets you move the chain with ease during sharpening. You can use this unit as a professional chainsaw sharpener. It sports quality lightweight metal and plastic construction. During installation the chain sharpener feels sturdy and most of the parts feel stable during operation. While the saw was designed for personal use, its overall design allows it to be used professionally. The unit measures 14.2 by 9.8 by 6.7 inches and weighs only 6.5 pounds. With its weight and compact build, you can move it from place to place and mount it with ease. The handle is rubberized with a strip grip running horizontally for comfortable use. The top housing and grinder housing keeps the sharpener safe. Unless you are replacing a grinder, the housing should be kept closed. There are different knobs and switches, each made of high quality plastic with line strip grip and enough resistance for precise adjustments. What can one expect from a chain saw sharpener with a 4200 RPM motor? It performs smoothly every single time. It is offered with a red chassis, yellow knobs and a few black parts. Generally, it looks awesome to the eye. The chassis is given a smooth finish while the knobs have lines or grooves to enhance grip. At the base of the sliding guides, the unit has a scale showing you different angles that you can set for precise sharpening. With the scale, you can easily turn the sliding guide to meet the specific angle that a chain needs to be sharpened at. The grinder housing is designed to open up smoothly, allowing you to change the grinding wheel easily. Change the Chicago electric chainsaw sharpener grinding wheel once it’s less than 3 inches in diameter. The Chicago electric chainsaw sharpener retails at $35 - $40. This is a great price, seeing that some sharpeners cost as much as $600 while most sharpeners in its category cost a little over $100. This is great value for money, seeing how the performance of the sharpener has been praised on most Chicago electric chainsaw sharpener reviews by users. After using the saw for a few months, as some users observe, you get used to it and attain precise grinding. Grinding wheels are available from the same manufacturer at less than $7. However, different grinding wheels fit ​this unit and you are, therefore, not limited. Oregon chainsaw sharpeners are known to be relatively expensive, but they offer great performance. The Oregon 520-120 is versatile, just like the Chicago chainsaw sharpener. It sharpens 1/4-inch and 3/8-inch low profile, and .404-inch and .325-inch pitch chains. The sharpener is more adjustable and adaptable than the Chicago chain sharpener, but this comes at a steeper price. During operation, the sharpener features a self-centering chain vise, a feature on all Oregon sharpeners. This, coupled with an adjustable vise handle allows you to sharpen any saw design and pitch precisely. The highlight of this chainsaw sharpener is in its preciseness. It sports top and down plate angle settings, enhancing the preciseness even further. The unit’s motor is rated for 3400 RPM. Though the grinding speed is relatively low, it still offers fast sharpening. The unit is heavier than the Chicago electric sharpener at 19.3 pounds when fully assembled. The Tek Motion Electric Chain Sharpener features a long-lasting cast aluminum chassis, letting you use it every day for high-volume sharpening. This makes it ideal as a professional sharpener. It features built-in light that allows you great visibility during operation. This is a feature that is conspicuously missing on the Chicago chain sharpener. A tilting vise fitted on the sharpener allows the sharpener to accommodate different cutters for versatility. It accommodates large 5-1/2-inch wheels. For ease of use and durability, the unit features reinforced hinges. During use, it feels sturdier than the Chicago chain sharpener. It is fitted with easy to use controls. However, it is heavier than the Chicago chain saw sharpener. The IS Imports Chainsaw Sharpener is an electric sharpener, just like the Chicago sharpener, only its price is a little higher. Nonetheless, it still poses as one of the most budget-friendly electric chain sharpeners. It works fast and efficiently on different saw designs and pitches. This makes it a versatile tool. The unit can be wall or bench mounted. It allows height and scale positioning for preciseness. This makes it an ideal unit for beginners as well as experienced users. For safety, the unit features a side guard that keeps the grinder locked in. Like the Chicago sharpener, it is offered with chain rotation rollers that move links for ease of sharpening. This offers you the best way to sharpen a chainsaw as a beginner. Even the best manual chainsaw sharpener has a somewhat steep learning curve, but this isn’t the case with electric sharpeners, which are very easy to use. The Chicago electric chainsaw sharpener is a great tool for chainsaw owners who want to start sharpening their own chains. When choosing a chainsaw sharpener, remember the importance of adjustability; this lets you choose the angle of sharpening and sharpen different designs of saws. Also remember that, even with a good electric sharpener, you will still need a file. 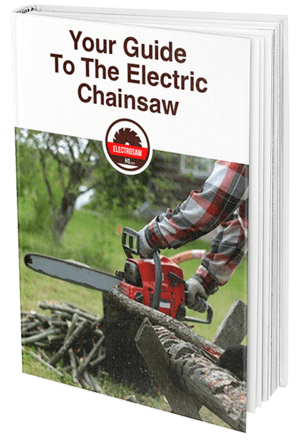 You can easily learn how to sharpen a chainsaw with a file guide online. This comes in handy when you have repeatedly sharpened your chain. Anyway, I hope you enjoyed this review, feel free to share your thoughts on the comments section and share the article with your friends if you found it useful!